An unprecedented level of detail is now available to the average person, for little or no cost. The same [digital] map literally shows every human settlement in the world at every scale, from the world’s largest cities to its tiniest neighborhoods and hamlets. Every country. Every city. Every road. All mapped in exquisite detail. It would seem to be the golden age of maps and map-reading. And yet, even as the map is becoming omnipresent, the map is fading in importance. If your phone will give you detailed directions whenever you need them, telling you where and when to turn, or your car or other vehicle will get you where you want to go automatically on command, then there’s no need to consult a map to figure out where you are or where you’re going. If a machine can read a map, a person doesn’t have to. The map is subsumed by the app or the vehicle (or even the shoe). Not only have most of the cities disappeared (Stamford and Princeton remain, curiously, but the larger Newark and Bridgeport are gone), but the roads have at once multiplied and turned into a confusing jumble. Look at the display of Long Island roads, for instance. 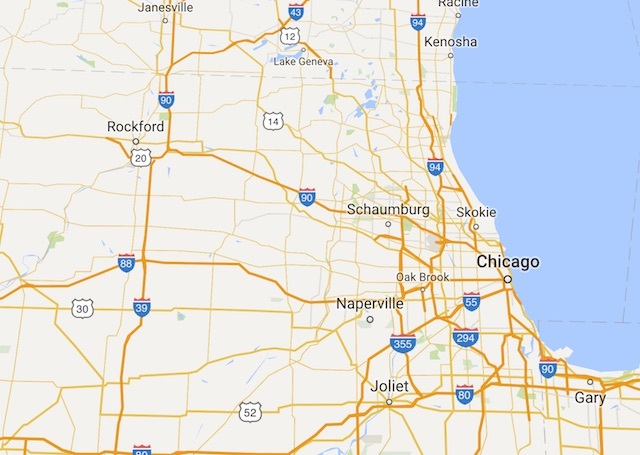 Relatively minor connecting highways have been given the same visual weight as major highways. A label for Route 495 has been added, but it just floats over a welter of equally sized roads. Comments O’Beirne: “In 2010, there were plenty of roads in the area, but you could at least follow each one individually. In 2016, however, the area has become a mess. With so many roads so close, they all bleed together, and it’s difficult to trace the path of any single road with your eyes.” By any standard of cartographic design, Google Maps in its current incarnation is a disaster. 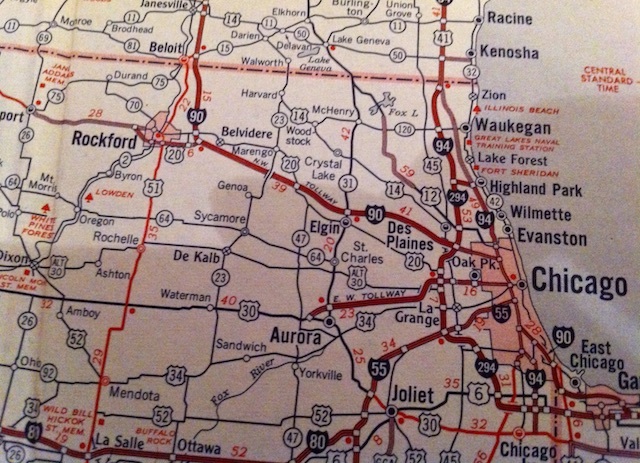 In another example, O’Beirne contrasts how an old paper map displays the Chicago area . . . The Google Map is, arguably, more pleasing to look at than the paper map, but in design terms the Google Map is far less efficient. Essential details have been erased, while road clutter has been magnified. As a tool for navigating the area, the Google Map is pretty much useless. And the Google Map, let’s remember, is becoming our universal map. Google, though, is adept at tailoring interfaces to devices. Yet the new map design appears on big computer screens as well as tiny phone screens. That suggests that there’s something more profound going on than just the need to squeeze a map onto a small device. 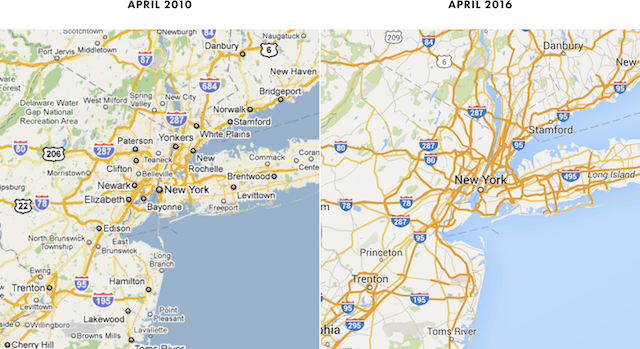 Implicit in the Google changes is the obsolescence of the map as a navigational tool. 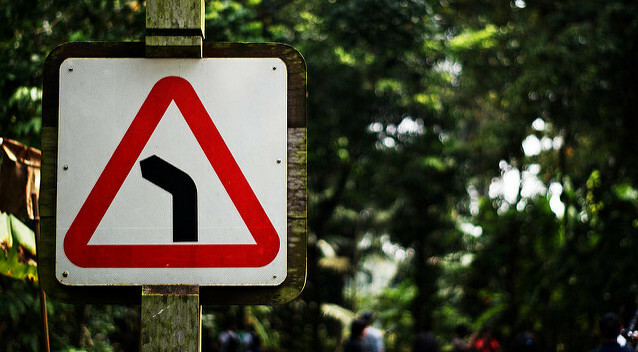 Turn-by-turn directions and automated route selection mean that fewer and fewer people ever have to figure out how to get from one place to another or even to know where they are. As a navigation aid, the map is becoming a vestigial organ. So why not get rid of the useful details and start to think of the map as merely a picture or an image, or a canvas for advertisements? We’re in a moment of transition, as the automation of navigation shifts responsibility for map-reading from man to machine. It’s a great irony: The universal map arrives at the very moment that we no longer need it. This entry was posted in Uncategorized on May 2, 2016 by Nick.